Home › Dental health › Did you know there could be a link between headaches and the position of your teeth? It is estimated that 14.7% of the worlds population suffer with headaches of some form. Of course they can be caused by a variety of causes but did you know that the position of your teeth could be one of those causes? Your teeth are in fine balance with one another, amazingly they don’t always meet together when you eat, it’s when you are not eating that problems can occur. Your jaw is a very finely balanced hinge which is attached to your skull with a complex array of muscles. Some muscles are dedicated to opening your mouth and others are dedicated to closing it again. Your jaw joint, known as your temporomandibular joint is extremely complex and permits movement in all planes, not just opening and closing like a crocodile! Your teeth begin the guiding movement of your jaw, when your teeth are fully clenched together they will be interlocked. In order to move your jaw from side to side your muscles need to open to prevent the teeth from interlocking, as they do this the jaw can move from side to side and the angle that it moves from side to side will be dictated by the way the teeth interlock and the angles of that interlocking. What can often happen is that the teeth are not actually in exactly the right place, known as a malocclusion. Your jaw joint will be most relaxed when it is in its most retruded or backwards/posterior position, in this most posterior position your muscles should ideally be relaxed, however this is often not the case. When your teeth are fully interlocked this is what is known as centric occlusion. When your jaw is a fully retruded posterior position this is what is known as centric relation. Ideally centric occlusion and centric relation should happen at the same time but if they don’t and the muscles around the head, face and neck are pulling on the jaw because the teeth are not in the correct position then this can translate into headaches. 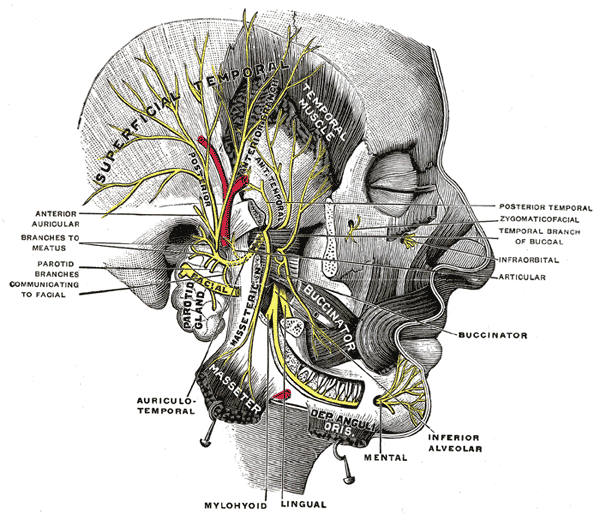 The following image shows where all of the muscles connect, notice how high up on the head the superficial temporal and temporal muscles go. If these muscles don’t relax then they can easily cause you to have headaches. Constant headaches can be exacerbated by the tension in the muscles caused by the malocclusion of your teeth. We are not saying that all constant headaches are caused by dental malocclusion but it would be worth talking to your dentist to see if they are in conjunction with looking at other forms of headache treatment. Teeth grinding headaches can also be a result of this. Because your muscles may not be fully relaxed as the teeth are not in the correct position then they may have a tendency to grind your teeth at night. Wearing a custom made night guard can help enormously with night-time teeth grinding. These custom night guards will be made by your dental practice. They work by sitting over the lower teeth and preventing the top teeth from locking into them. Because they can’t lock the muscles relax, this relaxation prevents the grinding and subsequent headaches. As well is using custom night guard is your dentist may also be able to selectively grind your teeth enabling them to move smoothly without putting pressure on the muscles. This is a highly skilled task and is known as dental equilibration. The following video gives a little insight into how this is done. Orthodontics to move teeth into a better position or restorative treatments such as dental overlays can also help solve dental malocclusion. ‹ What’s the point of a dental hygienist?